Before Pete Seeger, Bob Dylan or Bruce Springsteen, there was Woody Guthrie. During the Dust Bowl and the Great Depression, the iconic folk singer crisscrossed the country singing of miners and farmers down on their luck. Almost every folk singer since owes a debt to Guthrie, and his composition “This Land Is Your Land” is arguably the most famous American folk song of all time. In addition to writing lyrics for about 3,500 songs, he was a radio broadcaster, newspaper columnist, American soldier and author. But Guthrie also had a lifelong connection to Jews and Judaism. After he moved to New York in 1939, Guthrie met and married a Jewish woman, and penned a number of lyrics with Jewish themes. Now, with the release of two albums by the New York-based Klezmatics, Guthrie’s Jewish lyrics have been set to music. The first album, Wonder Wheel, features 12 previously unrecorded lyrics written by Guthrie in New York between 1939 and 1955. The second, Woody Guthrie’s Happy Joyous Hanukkah, focuses solely on the Festival of Lights, with songs ranging from easily singable dance tunes to a poetic retelling of the Chanukah story. “He walked the streets of Coney Island, tasted the blintzes and knishes, went to my grandmother’s for Shabbat dinner, met all her friends and the old rabbis, so it was this real one-on-one experience he had in this community,” says Nora Guthrie, Woody’s youngest child and the executive director of the Woody Guthrie Foundation and Archives. Guthrie’s wife, Marjorie Mazia, was a Jewish dancer with the Martha Graham troupe. The couple raised their four children in Brooklyn’s Coney Island, where their home at 3520 Mermaid Avenue sat in a heavily Jewish community, across the street from Marjorie’s parents’—including Guthrie’s new mother-in-law, the Yiddish poet Aliza Greenblatt. Other songs, like “Heaven” (“I wrote down this song for my own self and sing it now to my own soul/but if you’ll sing songs of your dreamings, then you will reap treasures untold”), “Gonna Get Through This World” and “From Here On In,” lack an explicitly Jewish connection, but their hopeful lyrics speak to the pleasant life Guthrie found in New York after years of hard traveling. 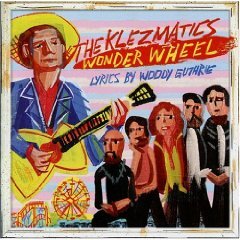 Wonder Wheel is the first of the Klezmatics’ eight albums to be sung entirely in English, and the musical style ranges from slow, spiritual ballads (“Holy Ground”) to fast-paced, rootsy conglomerates of sound (“Condor Bird”). The whole thing holds together expertly, showcasing many sides of Guthrie’s songwriting while standing as a strong collection on its own merits. The songs on the Chanukah album come from programs that Guthrie and his wife Marjorie performed at local YMHA’s and synagogues, where he would sing and she would make up dances and games that went along with them. Throughout his life, Guthrie consistently refused to choose a religion—preferring to list his affiliation as “all or none”—so the couple raised their children with a blend of traditions. The Klezmatics recorded 10 of Guthrie’s Chanukah songs, plus two klezmer instrumentals. Most are lighthearted and catchy, but the album is less accessible for everyday listening than Wonder Wheel. Still, it’s a fun collection with its own unique energy and particularly welcome for expanding the Chanukah songbook. “Happy Joyous Hanuka” counts down for each candle on the menorah (“Seven for the sons of Hannah that died/Six for kings and the tricks they tried/Five for the brothers Maccabee”), while “Hanuka Tree” is a simple dance (“Round and around my Hanukah tree/Round and around I go/Round and around my Hanukah tree/Because I love you so”). Before recording the albums, the Klezmatics performed many of the songs in a 2003 concert with Arlo Guthrie—Woody’s son and the author of hits like “Alice’s Restaurant” and “Coming into Los Angeles”—held at New York’s 92nd Street Y. The Klezmatics’ recordings are part of an ongoing effort Nora initiated to select unrecorded lyrics to pair with various artists. Arguably the most successful match was the pair of critically acclaimed Mermaid Avenue albums recorded a few years ago by Billy Bragg and Wilco. For Jewish folk music fans or those looking to expand their repertoire of Chanukah songs, it’s a good match.